Define goals, actors, organization, and activities directly during business analysis or from existing documents. 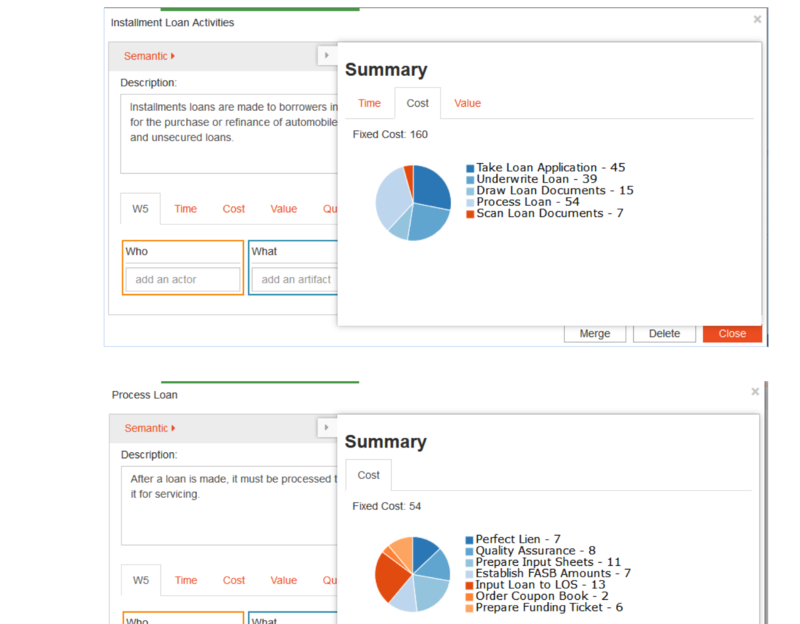 Blaze through early phases, from brainstorm to working GO-BPMN prototype. Use what you have - streamline the extraction and collection of relevant information from existing documentation. Metrics, a key to understanding and improving business operations, are defined and aggregated at every level. Many companies already have many of their processes defined in a variety of places, including standard operating procedures, internal policies, and handbooks, to name a few. The Discovery Accelerator streamlines the extraction and collection of the relevant information from this documentation. Once existing process documents are scanned into the Discovery Accelerator, the items may then be highlighted: activities, actors, artifacts, events, systems, goals. Additional categories may also be added, as suits each business' needs. At every stage stakeholders are able to view and discuss. By facilitating group comment and buy in, the process helps ensure that the end product clearly defines the existing processes. 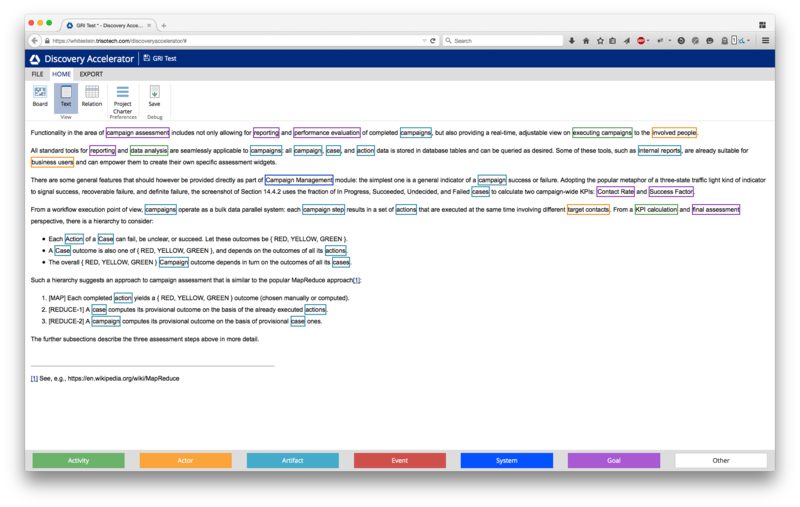 Two more views complement the Text View and allow adding more structure to the captured concepts, arranging them in logical hierarchies and allowing connections of various kinds among them . The Board View provides an intuitive and versatile view of the goals, actors, activities, events, systems and any other component used. 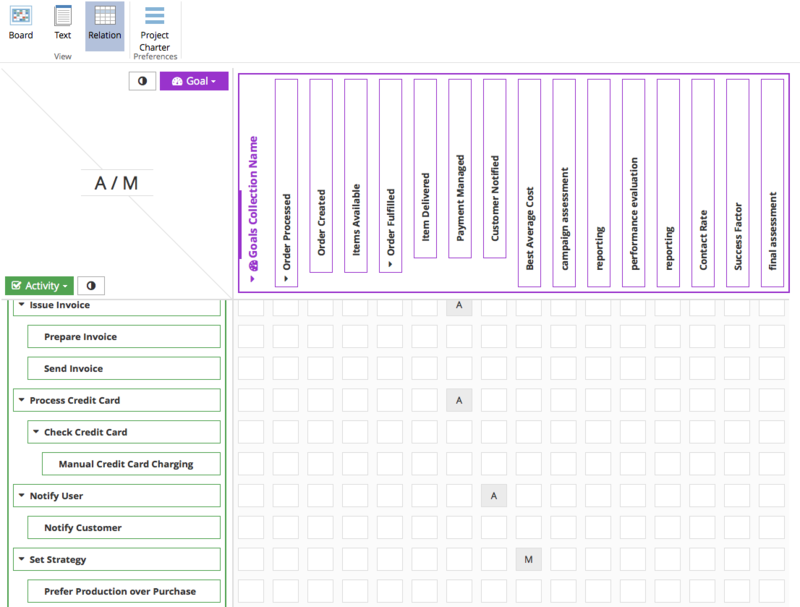 The drag and drop dashboard allows users to easily tailor the Board View to their preferences: elements such as goals, actors, and activities can be distributed across multiple layered collections. Each element can also receive specific attributes, such as related KPIs or individual semantics. The Relation View can show and modify links that connect different kinds of elements. The meaning of the link depends on the type of elements it connects: the actor/activity relation is for example a RACI matrix; the activity/goal one tells on the other hand how goals are achieved or maintained. Metrics, like goals, are important throughout the life cycle of a model-driven application, and can be effectively defined and applied already in the process discovery phase, ensuring that resources are properly allocated and driving long term business improvements. The Discovery tool allows metrics to be captured at the detailed activity level during the discovery process. Available metrics include time, cost, and value. The Discovery Accelerator will, in turn, aggregate these different metrics at every level of the defined activity and goal hierarchies. Quick wins can be easily identified, and chosen items can be flagged for review. Furthermore, a summary view supports efficient identification of process improvement opportunities, as well as the definition of KPI target or threshold values. Overall results for defined metrics are displayed according to hierarchical activity breakdown.